Sunday 29th May will be the 91st Comrades Marathon, the longest single day running event I’ve entered to date at 89.208 kilometres down from Pietermaritzburg to Durban. I think I’ve done OK on the training front- I’ve adapting my running style to run longer with less fatigue, and consequently I’ve knocked out a handful of good long runs. The scale of the event is huge: unlike most things ultras in the UK, there is a lot of support. Feed stations every couple of kilometres, toilets, closed roads, nationwide TV coverage for the full 12 hours, plus live streaming on YouTube. The journey from my home to the hotel took almost a full day; plenty of time to build up pre-race nerves, but I got chatting with a few other competitors in the immigration queue in Durban and the legendary race camaraderie kicked in, and my anxiety dissipated. We shared a taxi to the exhibition centre to get registered, before heading our separate ways. 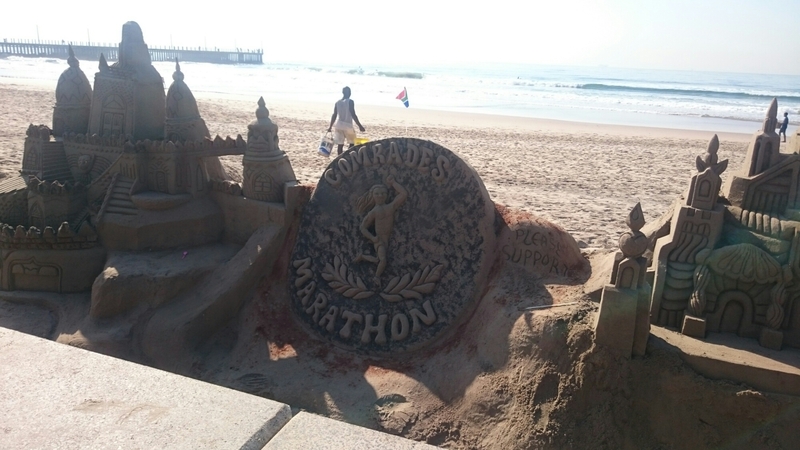 All throughout Durban competitors can be spotted the weekend of the race – all the ones I noticed are sporting some sort of races memorabilia, running or walking down the beach front, or carb loading at the many bars and restaurants in town. Comrades runners come in all shapes and sizes- I saw intimidating racing snakes and age groupers to potbellied runners who gave me hope. I went for a short run on Saturday morning to stretch my legs after the flights and came back to the hotel after half an hour with tan lines. Apart from the distance tomorrow, I have some fear over the heat! Fortunately it’s winter here and we should get a few hours of early morning running before the African sun is overhead. I’m hoping to spend the rest of my Saturday eating, resting and going for a little swim at my second hotel in Pietermaritzburg. Fingers crossed for the big day tomorrow!